A small group of Peacock community members attended the recent Wikipedia Editing Party at Upper Iowa University Henderson-Wilder Library. Due to the majority of participants having ties to UIU, Upper Iowa Archivist Janette Garcia said most of the topics researched during the event focused around the Fayette community. She explained that one of the struggles that Wikipedia faces is in providing unbiased information. For that reason, UIU employees in attendance were requested to not edit University pages. Garcia opened the recent event by providing a brief presentation about Wikipedia, local libraries, and a shared goal of providing free, reliable information to the public on the popular website. Topics were then presented and divided among the participants. 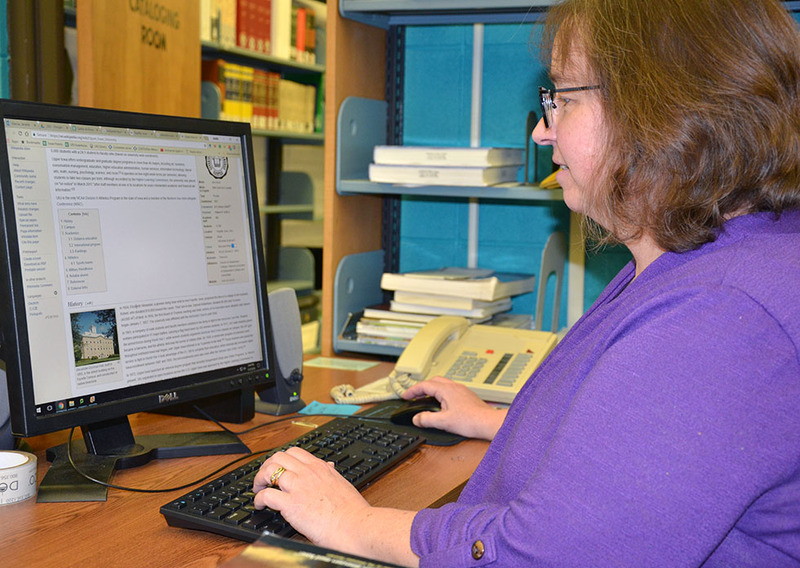 Upper Iowa University Archivist Janette Garcia (pictured) and other community members recently participated in a Wikipedia Editing Party at Henderson-Wilder Library. The party’s success has resulted in plans to host a similar event in the near future. With the majority of information coming from Fayette Community Library resources, the topics observed included Fayette schools, The Orphan Train, Volga River Recreation Area, The Barber Brothers, Soils, Watermelon Days, UIU Notable Alumni, Student Life, and Campus buildings. In addition to Garcia, those in attendance included Gail Moorman Behrens, Chad Cook, John Garcia, Jodi Hilleshiem, Scott Kotwila, Caitlin Schauer, Alex Ellis and Annette Butikofer. Following the event, many of the individuals present indicated that they would continue to conduct research on their chosen topics. Garcia said the party’s success has resulted in plans to host a similar event in the near future.